TestLog offers an integrated management environment in which you will create and manage, not just your test cases, but your entire test plan. It offers a structured approach to the testing process, yet remains versatile enough to fit into any existing methodology. 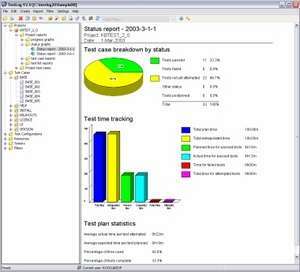 TestLog uses a lightweight XML database, which makes installation and configuration a matter of a few clicks. TestLogs inline reports quickly generate statistics, which show the progress of your project and estimate if the project is still keeping to the schedule. TestLog 3.2 1000 is a shareware program and can be used as a demo to try the software until the free trial period has ended. A full version of the program is available after the trial period ends. For security reasons, you should also check out the TestLog download at LO4D.com which includes virus and malware tests. Additional screenshots of this application download may be available, too.